Convinced that a strong and united European Union is the best way forward, we are determined to contribute constructively to the debate on our shared future. At the Sibiu Informal Summit, on 9 May 2019, we intend to provide guidance for the new legislative cycle and contribute to the Strategic Agenda for 2019-2024. We also anticipate a renewed commitment to a modernized EU that delivers on the issues that really matter to its citizens. We have paid close attention to the results of our intensive cycle of Citizens' Dialogues and Citizens' Consultations; in our work on the next Strategic Agenda, we will make our utmost in providing new and appropriate ways of engaging citizens and responding to their legitimate concerns. Whilst being on the path to economic growth, our Union still faces complex economic and financial challenges, which require careful and result-oriented measures. Our aim is to build a European economy that serves everyone, based on convergence between its Members States and combining economic growth and social well-being, in full respect of the principles of the European Pillar of Social Rights, including a stand-alone EU Gender Equality Strategy. Further decisive steps are needed for deepening the Single Market, especially in the areas of digital and energy and ensuring it provides a solid underpinning for an outward-looking, confident and more autonomous EU in a challenging global environment. We recognize the importance of trade for growth and job creation through an ambitious and balanced free but also fair trade agenda within a rules-based multilateral system. We support the swift establishment of a European Labor Agency enhancing EU rules on fair labor mobility and ensuring their fair and effective enforcement. In this regard, we note Cyprus’ readiness to host the seat of the Agency in Nicosia. A modern EU requires an adjusted and flexible budget for 2021-2027 and with sufficient means. We welcome the European Commission's proposals on the new Multiannual Financial Framework (MFF). We are committed in doing our utmost aiming at concluding negotiations by autumn 2019, and we stand ready to assist the Romanian Presidency of the Council in its efforts. We attach particular importance to policies with clear deliverables that promote growth and competitiveness, and enhance convergence and solidarity between Member States. Whilst agreeing on the need to address both new and pressing challenges, we equally believe in sustaining the essential role of the two main investment policies, the Common Agricultural Policy and Cohesion Policy, with proven added value and contribution to the Union’s development. Both policies should be adequately financed. All rebates must be removed as from 2021. We acknowledge the severe consequences and direct threat that Climate Change poses to the world and to the Southern regions of Europe and the Mediterranean basin in particular. It is one of our citizens’ main preoccupations to which we shall swiftly respond by shifting to a low carbon model of economy, thus confirming our leading role in setting the international Climate Change agenda. We welcome the outcome of COP24 in Katowice, including the communication or updating of the EU National Determined Contribution by 2020, taking into account the collective further efforts needed and actions undertaken by all Parties to meet the objectives of the Paris Agreement. We anticipate the swift adoption of a result – oriented and ambitious EU Strategic long-term vision for a carbon neutral - economy by 2050. Cyprus stands ready to assume a regional role to tackle climate change by promoting coordination and cooperation between the countries of the region so that a targeted Action Plan is developed. We reaffirm the importance of the EU relations with Turkey and reiterate our commitment to maintaining an open dialogue, to addressing common challenges and to cooperating in essential areas of joint interest such as migration, counter terrorism, transport, economy and trade. We are, however, especially concerned with the situation in the country. Recalling previous Council Conclusions, we reiterate that Turkey must fulfil all its pending obligations under the Negotiating Framework including its obligation to respect International Law and good neighborly relations in the Aegean and the Eastern Mediterranean. It is also recalled that recognition of all EU Member States is a necessary component, calling Turkey to normalize its relations with the Republic of Cyprus. The full, non-discriminatory implementation of the Additional Protocol to the Association Agreement and the lifting of the restrictions in its ports and airports/airspace towards Cyprus and EU companies related to Cyprus, will also be beneficial for the whole region. The Union must become a credible security provider for its citizens, in line with the level of ambition of the EU Global Strategy, enhancing its strategic autonomy and its capacity to act. We welcome the substantive progress made in the area of security and defense, including in implementing Permanent Structured Cooperation (PESCO) and in the negotiations for the establishment of a European Defense Fund and we stress the importance of keeping the momentum. 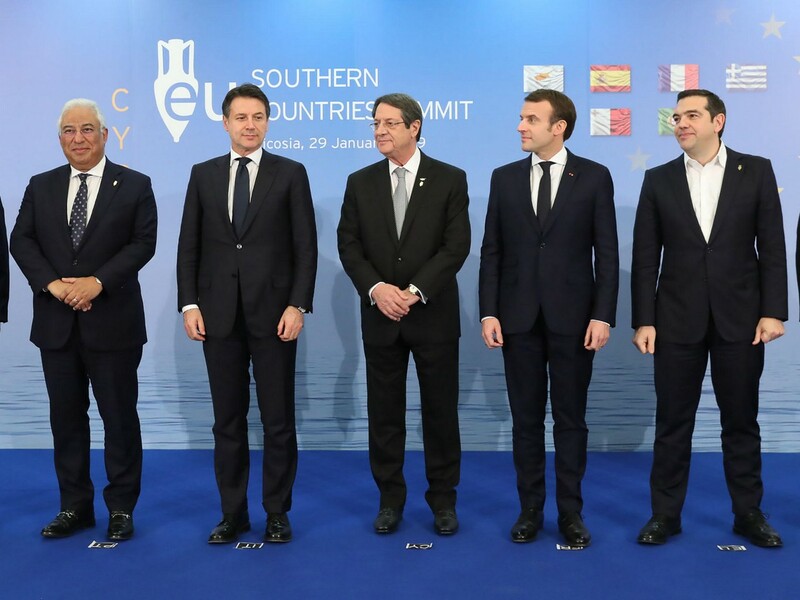 European action shall be aimed at addressing regional and global challenges with a special focus on the Mediterranean, EU’s southern neighborhood, and Africa. The Sahel Region continues demanding particular attention. Democratic, stable and prosperous partners is a strategic priority and in the interests of the EU. We attach particular importance to the strengthening of relations and cooperation between the EU and the Arab world and we look forward to the upcoming EU-League of Arab States Summit, in February 2019. The Summit gives an excellent and timely opportunity to coordinate our efforts to jointly address regional challenges and threats, and meaningfully enhance relations in various fields, notably security, migration, fighting terrorism, sustainable development, climate change. We are committed to a coordinated action at all levels in achieving the goals set in the present declaration and we agree to hold our next summit in 2019.